Graphic novels have come a long way in the past two decades. Back in the early '90s, when people first suggested that graphic novels might be a 'next big thing' in publishing, there wasn't enough quality material around to make much of an impact on a largely indifferent public. Fortunately, such adverse market conditions didn't deter comic creators like Charles Burns from ploughing literally a decade's worth of work into creating some of that quality material - material that is now part of what is regarded today as a healthy growth area for the publishing industry. 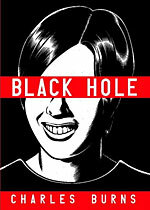 Originally serialized as a ten-part comic over the course of ten years, Burns' BLACK HOLE has recently been collected into a single volume as part of Random House's cherry-picked line up of acclaimed graphic novels. It has also garnered quite a bit of acclaim for itself in the process, even amongst those who might never have come across the serialized comic. So, does BLACK HOLE live up to its acclaim? The first thing that strikes you when you pick up the collection is what a handsome package it is. Satisfyingly hefty, it is a hardback that has a shape and format pretty similar to those of most other standard text hardback tomes in the bookshop. Its dust jacket is clear, simple, and an effective spin on the high school yearbook photo, a design that resonates well with the book's teen angst-theme. No doubt about it, this is a book that fits well in the hand and looks good on any coffee table or bookshelf. That might sound superficial, but the graphic novel is a visual medium, and the look can be more than half the battle of getting people to read stuff - not just graphic novels, but books in general. BLACK HOLE is a book that makes you want to pick it up and flick through it as soon as you lay eyes on it, and that is no small feat. But it's once you start flicking the pages that you are really sucked down into Burns' world. His cloying, oil-slick like art envelops the reader - you almost expect viscous ink to come off on your hands. There is something slightly nauseating about it - but in a good way. As in his previous BIG BABY comic strips, Burns' artwork is designed to create a palpable sense of unease and sickness that reminded me of Brian Yuzna's horror film, SOCIETY. Both BLACK HOLE and SOCIETY entertain the notion of disease. However, while Yuzna's movie rages in a largely ineffectual and adolescent fashion at the disease of 'society', with those whom society has corrupted appearing monstrously disfigured, BLACK HOLE is much more insidious. But despite more and more of the town's infected youth seek refuge in the woods, dubbed 'Planet Xeno', there is no massive panic from the townsfolk. This isn't a story about alien invasion, but of alienation. The plague, like the book's title, is only a metaphor, and both metaphors are hurled at the reader with sledgehammer subtlety. Imagery of black holes of various kinds litter the narrative, from jagged wounds to bullet holes, but they are all just a substitute for the ultimate black hole that marks the passage way into sexual experience, the one meaning that lies behind the mountain of metaphors. Many passages in BLACK HOLE will strike the reader as wistful elegies to sexual awakenings, a romantic anthem to a doomed youth - albeit a nice, relatively privileged, middle-class youth that isn't going to be mown down in Flanders' fields. This is, I think, where I fell out of sympathy with many of the characters. Their problems are not nearly as insurmountable and isolating as they seem to fear. But of course, unsympathetic self-absorption is a bit of a hallmark of many teen-age lives, particularly those viewed through the rear-view mirror. Burns is nothing if not unflinching in his portrayal of teenagers' confused loyalties, casual cruelties and outright brutalities towards each other, and in this the narrative is at its most compelling. Liz's account of being drugged and raped by her supposed friends and housemates, told as it is through spare dialogue and obscured images, is particularly effective and harrowing. Ultimately, BLACK HOLE is more than the sum of its parts. While it possesses a clear beginning, middle and end, it is by no means a straight and simple story - something that I suspect might annoy those who prefer a strictly linear narrative. It does contain a whodunit about someone haunting the woodland retreat of Planet Xeno, killing and mutilating its new denizens, and that killer's identity and fate is revealed before the final page, but BLACK HOLE's scope goes far beyond a simple mystery. The real test of the work is in what lies outside that central and somewhat prosaic narrative; it's about the pathetic, foolish, squalid, miserable, fantastic and transcendent lives of adolescence. You go on a journey with them and, like a journey shared with any adolescents, they'll make sick, and angry, annoyed and perhaps even a little envious by the time you get to your destination. But, with BLACK HOLE, as with life, the destination is less important than the journey.